This past month, two Open AIR researchers visited CIPPEC, an Argentinian think tank that has launched a new international research project on the sharing economy. Nancy Salem, representing Open AIR’s North African hub at the A2K4D Centre in Cairo, was among a select group of scholars invited to contribute to the project. She’ll be participating in a study of the gender dimensions of the ride-sharing services that are disrupting transportation industries in Egypt. Prof. Jeremy de Beer, an Open AIR co-founder and co-director, as well as a member of the CIPPEC’s Advisory Board on the project, attended to explore the potential for collaboration and comparisons regarding the sharing economy in Africa and Latin America. It has been argued again and again that the sharing economy fits African economies exceptionally well, because many African countries already have large informal economies where collaborative, peer-to-peer businesses thrive. As one blogger explains, ‘Kenyans have always had a second job, rented out spare rooms or shared their cars.” Some argue that the sharing economy is an important part of economic development in Africa, while others worry that these business models exploit inequalities on the continent. Nevertheless, examples of the sharing economy are everywhere on the continent, and these businesses contribute to everything from better healthcare and education to better transportation and work spaces. Citizens from various African countries have shown enormous ingenuity when developing new businesses in the sharing economy. Several transportation apps have been developed by Africans, including ride-sharing services such as Taxify in South Africa, Littlecabs in Kenya, and Find A Lift in South Africa. 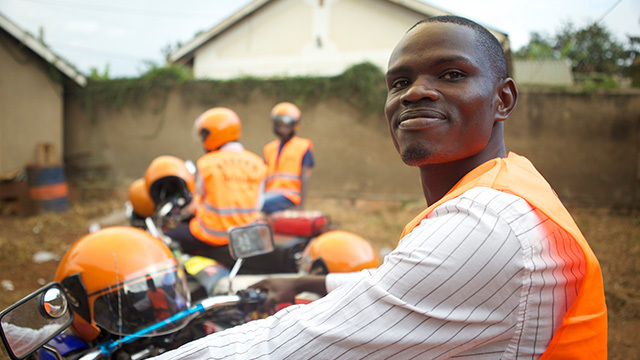 One particularly interesting example is SafeBoda in Uganda, which operates like an ‘uber for motorcycles’. While Kampala has always had motorcycle-taxis, these are notoriously unsafe and lead to many hospital admittances. SafeBoda has set a high standard of safety measures for their drivers and have drastically reduced rates of road accidents while also providing Kampala with a reliable transportation service. Similarly, Digital Matatus gathered data on Nairobi’s transit system and, for the first time, created a map of the transit system in Nairobi for city-goers. This has made it much easier to navigate the city. As well, innovative solutions to meeting the educational and healthcare needs of West Africans have also been developed by Africans. Prep-Class in Nigeria and Open University West Africa (OUWA) are two such examples: Prep-Class connects students with tutors; while OUWA combines the Massive Open Online Course (MOOC) Model with on-the-ground training to educate business professionals or those tackling societal needs. The Medici app in South Africa has also been able to connect rural areas to remote access medical advice and consultations. Further, innovative collaborative workspaces for startups have bloomed across Africa. Worknasi in Tanzania, provides online office and meeting technology to help startups waive the overhead costs of office space. Meanwhile, coworking spaces have sprouted throughout Cape Town, Nairobi, and Cairo. There are also numerous examples of international digital sharing economy companies expanding to African countries. Examples include Uber, Airbnb, and the Khan Academy expanding in Africa. The Australian Open Food Network, which supports small farmers, and RecruitLoop, a job recruitment service, are have both expanded to South Africa. These businesses bring flexible employment opportunities to people in countries like Egypt, which has some of the highest unemployment rates in the world. Some worry, however, that the expansion of external platforms like AirBnB and Uber threaten African businesses. They argue these companies simply formalize Africa’s already existing informal economies and stifle local entrepreneurs from building grassroots businesses. Open AIR is finding that the sharing economy – a new flexible way of doing business that fits already existing African traditions – shows significant promise for African development and businesses. While it carries risks and challenges, it is an exciting place for innovative ideas to expand quickly across Africa and to continue to encourage economic growth. Going forward, Open AIR will be collaborating with researchers throughout the Global South on cross-regional comparative research into this increasingly important area.